My name is Mini Yuan, a freshmen of the class of 2019. I double major in Molecular/Cellular Biology and Medicine, Science, and Humanity. 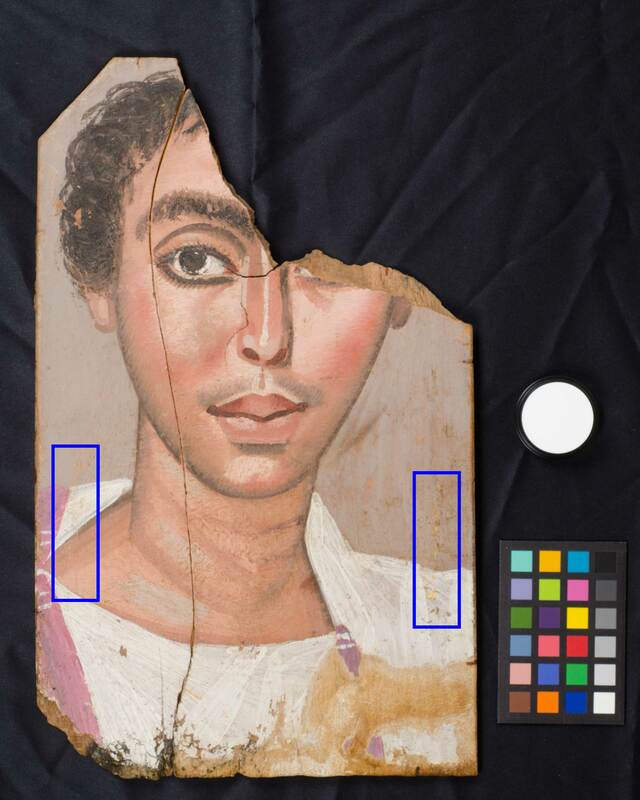 Loving art and detective stories, I found strong interest in the research on archaeological objects, Roman Egyptian Mummy Portrait in this case. I hope we can recreate the art piece and tell the story behind it following every little clue that's left for us. Dr. Caroline Wilkinson talks to us from the Face Lab in Liverpool, England. This week before we had the chance to take a closer look at the portraits under the microscopes (and discovered a speck of gold on the Portrait of the Man! 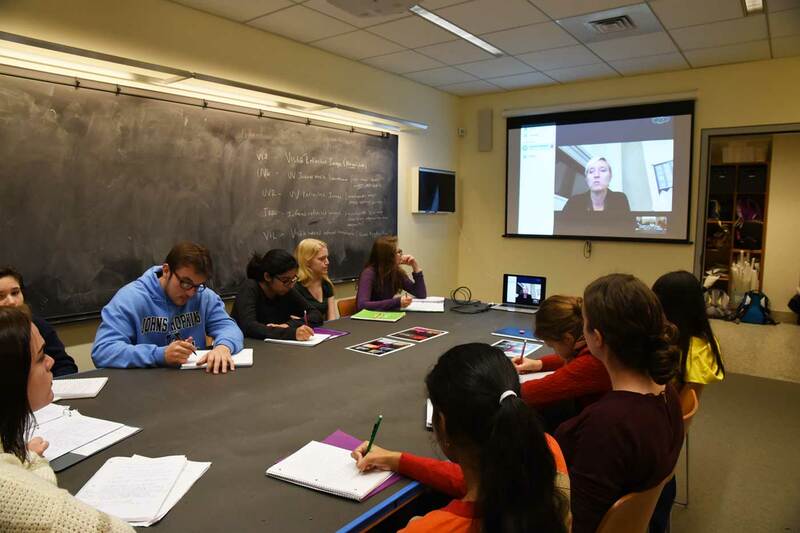 ), we had the privilege of speaking with Dr. Caroline Wilkinson, Director of the School of Art & Design and Director of Face Lab at Liverpool John Moores University. We were particularly excited to talk to her after having read her work on the forensic reconstruction of faces from the skeletal remains of mummies and comparing her reconstructions to the associated mummy portraits. Dr. Wilkinson explained in detail how her anatomy-based skeletal modeling system in combination with anatomy standards for skeletal standards enables the forensic facial reconstruction of—in the context of our study—mummy remains. She reminded us that the shape of the skull contributes most to what the external appearance of an individual might have been. Beginning with a three dimensional image (or previously, a physical model) of the skull, she adds tissue depth markers at critical points on the skull; these markers are based on existing tissue depth averages for specific contemporary populations. For ancient Egyptians, she uses information from contemporary African populations. Next, muscles of the face and of the neck, which are similar for all human populations, are built up with the guidance of the tissue depth markers. Then, the more recognizable facial features, such as the eyes, the nose, and the lips, are predicted based on the examination of the skull, but also on existing clinical standards for contemporary groups. Some features like ears are difficult to recreate because they are made mostly of cartilage. Finally, skin layers are applied but details such as skin color, eye color, wrinkles, and moles cannot be learned from the skull. Based on Dr. Wilkinson’s studies, 70% of all features of a face can be reconstructed to within 2mm of accuracy based on examination of the skull. Gold leaf is present in the two boxed areas. Were these the borders where the mummy wrappings originally covered the portrait, and were embellished with gold leaf? In the case of our portraits, they were detached form their original mummies over a hundred years ago, and thus comparisons between a face reconstructed from skulls and the painted portrait cannot be carried out; we are all too aware of how much more information we might have been able to add to our examination of the portraits if we had the original mummies that they were once associated with. We asked Dr. Wilkinson what we can possibly learn from a forensic perspective about these two individuals from their portraits, and if we can use these portraits in comparison with others to find some family members related to our portraits based just on physical appearance. She cautioned us to be careful about drawing too many conclusions from only one piece of evidence, and told us to search for particular hereditary features that might suggest family relationships, for example cleft chins (which the young man has), shape of the nose (which looks unusual on the young man’s face), and the attached ear lobes. However, we should take caution that some features can be prevalent across certain populations rather than families. We returned to looking at both the “Young Man” team and the “Man” team under the microscope. Specifically, we looked for the sequence by which the layers of paint were applied. The sequence might explain the painting process and the role of painters and apprentices. During the examination, very excitedly, we discovered a speck of gilding on the outer corner of the proper left eye on the Man’s portrait. (Unfortunately this doesn’t seem intentional—it looks like this small fragment of gold leaf blew onto the surface from elsewhere). The “Young Man” group discovered a set of indentations around the edges of the portrait, which might be due to framing when exhibited or transportation purposes. In addition, the potential inscription above the young man’s proper left shoulder noted previously was carefully examined but no conclusion has been drawn. There is so much information hidden in the portraits that they can always surprise us with new discoveries from difference aspects and methods. So if we keep trying, maybe eventually we can put the puzzle together. 10 Responses to Week 7–Guess How I Looked? I really enjoyed hearing Dr. Wilkinson speak. The process by which they form an entire face based off a skull is very fascinating! Imagine how much more we could know about the men in our portraits if we had their skulls! This post is also a good recap of some of the interesting discoveries we have made so far. Great article Mini! This article was very interesting Mini! I didn’t realize how much the structure of your skull affected your facial features until Dr. Wilkinson’s articles. The fact that they can be so accurate is astounding, 2mm is a very small range of accuracy. It will be interesting to compare these two portraits to other portraits that we find in our research to see if they could have come from similar populations, although our likelihood of finding an actual family member is very slim and even harder to prove as Dr. Wilkinson pointed out. Finding the gold on the Portrait of a Man was very exciting as well as the gold on the Portrait of a Young Man. How thin the gold leaf gilding was astonishing, so it is no surprise that the majority of the gilding could have rubbed off. Well put Mini! It was so interesting to talk to Dr. Wilkinson. Her experience working not only in a museum context, but also working with the police with facial reconstruction for bodies they’d found really helped demonstrate how widely applicable all of this technology is. It was so fascinating to watch the process from start to finish of the facial reconstruction. It was fascinating to talk to Dr. Wilkinson! Since my science background is quite scarce, I am always astounded by the knowledge we can get from technology. Great post Mini! Dr. Wilkinson definitely brought something new to the table with all of her research! She gave us a chance to think about another side to our portraits, and I wish that we had the mummies to match our portraits! Additionally, the process Dr. Wilkinson uses seems very complex, so I was shocked to find that the entire thing could take as little as a few days! Great article! I was so impressed that Dr. Wilkinson was able to recreate an entire face off of just a skull. I wish that we had the mummies to go with our portraits so that we could compare their ages to their ages in the portraits and see if the ages matched. This process of facial reconstruction that Dr. Wilkinson described reminded me of an earlier article we read about diagnosing neurological diseases based on the skulls of mummies. The article highlighted how certain diseases produced noticeable changes in skull structure, and thus we are able to make an accurate diagnosis solely based on physical examination. If our paintings had their accompanying mummy, I could only imagine the additional information we could gather and possibly even have a 3-D facial reconstruction made, similar to those done by Dr. Wilkinson. The facial reconstruction that Dr. Wilkinson introduced us to was insane! Dr. Wilkinson’s incredibly accurate models of the subjects showed me just how much one can gain from the information from the skeletal remains, and I definitely paid attention to the way the fat was remodeled in the pictures and how similar to the portrait’s depiction it ended up being. Great post Mini! I’ve always been very interested in forensics so I found Dr. Wilkinson’s work really fascinating. I had never thought about how this work could be used in an archaeological context. I can’t even imagine how much information we would be able to gather if we had skulls associated with our portraits. Great post! I am still very astounded how it is possible to reconstruct a full model of the face from a single portrait and its mummy. I wonder how our men would have looked like – similar to the portraits or completely different, if their skulls did not match? More about Week 7–Guess How I Looked?